We’d love your help. Let us know what’s wrong with this preview of The Creativity Project by Colby Sharp. Colby Sharp invited more than forty authors and illustrators to provide story starters for each other; photos, drawings, poems, prose, or anything they could dream up. When they received their prompts, they responded by transf Book advocate Colby Sharp presents more than forty beloved, award-winning, diverse and bestselling authors and illustrators in a creative challenge! To ask other readers questions about The Creativity Project, please sign up. I sort of helped write and edit this book, so I'm super bias. I am proud of the book, and I think it will add value to the lives of young readers. I'm really looking forward to hearing what people think, and seeing how they use it with young readers. AS A CONTRIBUTOR TO THE CREATIVITY PROJECT, I AM COMPLETELY UNBIASED IN GIVING IT A FIVE-STAR REVIEW (But it is awesome). I loved this! All writing teachers need this book. There are so many creative writing prompts that you can use in the classroom - and all from authors your kids will recognize. I cannot wait to get my own finished copy to add to my arsenal for teaching creative writing. This book is a fantastic resource for English teachers--it is filled with prompts and responses that are phenomenal for teaching both reading and writing to students of all ages. This book is also fantastic for non teachers because it's funny, sweet, creative, and just an absolute pleasure to read. 10/10 would recommend to any reader of any age and occupation! Awesometastic. There's no other word adequate enough to describe this book, so I'll use Colby's! The prompts were equal parts inspiring and mind-boggling. I mean, that song Jenni Holm had to write! Cray-cray! My heart was so happy when I got to the end and saw all the prompts with no responses, because honestly, I wasn't sure how I'd tackle a response after reading what someone else did, especially when "someone else" was 44 of my favorite and/or well-known authors! I LOVE THIS BOOK!!!! I laughed. I cried. I totally enjoyed every minute of this book! It is a must have book, especially for teachers and writers. What an awesome concept for a book!!! I will be purchasing a copy for my writer's group to help inspire them even more. I will probably be purchasing a copy for myself too. Yeah! It is that good!!! I've saved the reading of this one for spring break so that I could really look inside of the book and the ideas presented. Colby Sharp is a friend and one of the many good things that are coming out of the state of Michigan when it comes to educational approaches and strategies. Here, Colby solicits the help of some of today's most recognizable figures in children's and middle grade and young adult poetry, literature, and illustration. As the title suggests this is generative creativity born of I've saved the reading of this one for spring break so that I could really look inside of the book and the ideas presented. Here, Colby solicits the help of some of today's most recognizable figures in children's and middle grade and young adult poetry, literature, and illustration. As the title suggests this is generative creativity born of Colby's sending out invitations to his friends in the business and them, in turn, challenging one another to create "texts" from the prompts given to them. What I like most about THE CREATIVITY PROJECT is the range and scope of the "texts" presented. As a mentor text, Colby's book could encourage classroom teachers to look beyond the traditional prose response to tap into poetry forms and sketching to communicate ideas and to generate new ideas. Not only does the book present invitations and responses, it does spark some curiosity in regard to who the contributors are. Their information is in the back of the book as contributors, but it would be a good idea to have titles out by the featured writers and artists as these may be go-to mentor writers and illustrators for students in the room. But, while we are talking about students and classrooms, the book would work just as nicely to charge up our own creative energies. In the introductory letter from Colby, he suggests just this. I found myself wanting to "play along" with the writers, poets, and artists found within THE CREATIVITY PROJECT. I like that the prompts are not separated by genre or format and this allows the reader to move through the complex weave of creativity and how it often presents itself. I LOVE this book. What a great concept! The basic gist? Colby sent out a request for children's authors to create prompts and then distributed those prompts among the authors- and then published the prompts and responses side by side. I am thinking of becoming a classroom teacher again just so that I can use these ideas! Each prompt has endless opportunity for response, the responses cross over many genres, the idea itself could be used to create a "creativity project" on campuses or between camp I LOVE this book. What a great concept! The basic gist? Colby sent out a request for children's authors to create prompts and then distributed those prompts among the authors- and then published the prompts and responses side by side. I am thinking of becoming a classroom teacher again just so that I can use these ideas! Each prompt has endless opportunity for response, the responses cross over many genres, the idea itself could be used to create a "creativity project" on campuses or between campuses or when PALS are working with their "PALees." The book could be used in writing institutes or academies...or it can just be used for adults, like me, who need a little push to be creative again. Oh, I loved this. I've been in a re-reading and romance RUT, and this got me out of it. Many of these stories and prompts were STUNNING. (They were uneven, but I've never read a set of short stories where that wasn't so. Also - their very variety will attract a variety of students/writers/artists/creators). BUT anyone brave enough to contribute a prompt or response to this book deserves my respect. And any book I read in a single day? It rocked. It made me write, too! It woke up my brain. Thanks Oh, I loved this. I've been in a re-reading and romance RUT, and this got me out of it. For creative writing teachers, The Creativity Project” offers a plethora of ideas from many of the most popular kid-lit authors whose books students love. Thus it offers insight into the minds of working writers and their processes. It’s also fun to see how pro For creative writing teachers, The Creativity Project” offers a plethora of ideas from many of the most popular kid-lit authors whose books students love. Thus it offers insight into the minds of working writers and their processes. I love the format of the book and was excited to see who was responding to whose prompt. It really is a unique creation that projects a feeling of friendship among the contributors. I love this book for all the friends it holds inside. #nerdybookclub #nErDcampMI Fantastic writing/illustrating prompts for ALL! Mr. Sharp wrote in the introduction, “A few weeks later, the pieces started coming in, and HOLY SMOKES! I was completely blown away.” As I flipped through the pages tonight myself, perusing the structure of the book, I, too, was in awe of the prompts themselves and the projects that were submitted. For example, author Peter Brown submitted this prompt: “Create something that includes a tree looking out-of-place.” Illustrator Lauren Castillo answered with a drawing of a city scene, and there’s a tree there, looking quite out-of-place. I can’t wait to read this book deeply again, and maybe even try something myself. Thank you, Mr. Sharp, for challenging all of us — experts and amateurs — to create! Can I rate this book with 10 stars? This is such an outstanding book for teachers, parents, and students. I have so many ideas to bring this to my students to increase their creativity muscles. We are going to start with using the book and then we will branch out to other prompts, to creating prompts and possibly even to compiling our own version of the book. Every teacher should have a copy of this book! This is an amazing idea. So many of my favorite authors are in here, AND it gave me writing ideas. I can't wait to share this book with my teacher. My students and I are enthralled with The Creativity Project. It truly is an “awesometastic” resource for inspiring creativity in your writers. Highly recommend. The most fun part of this, is trying a few of the prompts yourself, or having your students try, and then reading what direction some of your favorite authors took it. Some of my students marveled at just how talented and creative some writers can be (Lemony Snicket's response to Kate DiCamillo was a favorite) and some students felt like they were more creative than some of their favorite authors. Which was inspiring! A book needed to inspire middle grade readers & writers! I devoured this book over the summer! The writing prompts, pictures & short stories are a must for any classroom. An innovate idea & format. Do yourself a favor and buy a copy (or two) fir your classroom! I thought this book was interesting. It is filled with writing prompts and then, responses to these writing prompts. From pictures to texts, these writing prompts were all over the place for they had great variety. I really enjoyed the prompts and the responses were okay. Many of the responses felt off for me, and I just didn’t care for them. There were a few that I really enjoyed and they were very creative. The book is about promoting creativity and that they did. I really liked the idea behin I thought this book was interesting. It is filled with writing prompts and then, responses to these writing prompts. From pictures to texts, these writing prompts were all over the place for they had great variety. I really enjoyed the prompts and the responses were okay. Many of the responses felt off for me, and I just didn’t care for them. There were a few that I really enjoyed and they were very creative. The book is about promoting creativity and that they did. I really liked the idea behind using picture prompts and writing a response based on the picture. The pictures they included in this book consisted of nature scenes, faces, and drawings. The writing prompts were creative and included: parts of poems, the beginning of a sentence, a conversation, a scenario, and situations similar to these. You’re visiting a distant relative who lives in an old Victorian house. While everyone is downstairs, you sneak away and go upstairs and come across a loose floorboard. You inspect it, the board comes up, and inside it you find….. I remember………..for 5 minutes write down everything you can remember- good and bad memories, funny memories, anything. Then, pick one and write about it. I liked the variety inside this book, some ideas were more creative than others but their ideas were worth pondering over. Their ideas might inspire you/me to create some great writing prompts yourself/ourselves. This is a fun writing tool. I decided to read this book to prepare for a workshop I'll be attending in two weeks where this book will be featured during one of the presentations. Holy smokes, am I glad it's going to be featured, because I'm not sure I would have picked it up otherwise, and I surely would have been missing out. 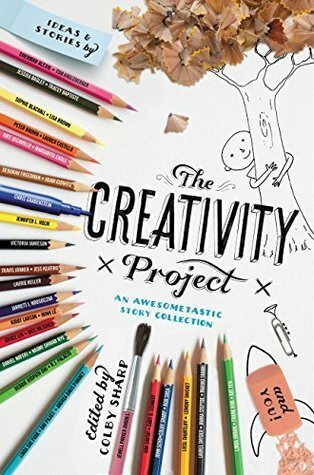 The Creativity Project is the perfect name for it, because it is one of the greatest celebrations of creativity, individuality, and uniqueness I've read. Having read many of the authors featured, I r I decided to read this book to prepare for a workshop I'll be attending in two weeks where this book will be featured during one of the presentations. Holy smokes, am I glad it's going to be featured, because I'm not sure I would have picked it up otherwise, and I surely would have been missing out. The Creativity Project is the perfect name for it, because it is one of the greatest celebrations of creativity, individuality, and uniqueness I've read. Having read many of the authors featured, I really enjoyed how each of their prompts and responses reflected their writing style. For example, Chris Grabenstein's story "Fluffle-Picking Time" had me laughing out loud and is just what I would have expected from such a funny author, while Grace Lin's story stopped me in my tracks with the unexpected twist and connection at the end, very reminiscent of how everything comes together at the end of her novel Where the Mountain Meets the Moon. I also loved how the idea of "creativity" was expanded beyond words and that cartoons, photos, drawings, and even sculptures were included, to show that creativity does not manifest as just one thing. I also am thrilled with the extra prompts included at the end and am already thinking of ways I might be able to use them with my students. I have been teaching creative writing for nearly twenty years and there are very few books I recommend to my students. (Bird by bird, What If? On Writing) I am not generally a fan of the How-to-write book. In fact, I don't think you can really "teach" creative writing. You can provide opportunities to write, give prompts, lots of encouragement and then give feed back (and even that can be flawed!) ..but basically you just need to WRITE and write and write and get better. The Creativity Project d I have been teaching creative writing for nearly twenty years and there are very few books I recommend to my students. (Bird by bird, What If? On Writing) I am not generally a fan of the How-to-write book. In fact, I don't think you can really "teach" creative writing. You can provide opportunities to write, give prompts, lots of encouragement and then give feed back (and even that can be flawed!) ..but basically you just need to WRITE and write and write and get better. The Creativity Project does just that, it gives traditional prompts and untraditional prompts and then (in a very "creative and unusual way) shows how other artists have interpreted those prompts in traditional and untraditional ways. This book is a game changer. Teacher, literacy advocate, and book lover Colby Sharp brought together creatives to create and respond to prompts. And it is magical. The only downside? That I have to wait until March 2 This book is a game changer. Teacher, literacy advocate, and book lover Colby Sharp brought together creatives to create and respond to prompts. And it is magical. This is indeed "awesometastic"! I received an advanced copy at NCTE and I regret not reading it sooner. It is way more than a variety of prompts and responses from authors and illustrators. The wide range of art and styles of texts, the unique and original content, and the matches made between contributors all make this a book that readers are going to love. Do yourself a favor- preorder this now. Opening this book is like diving into a lake made of magic. The prompts are outstanding, and the responses even BETTER than you’d expect (despite a line-up of some of the best writers in children’s literature). This should be on the shelves of every teacher’s classroom and in the heart of every creator. As a pure reading experience, 3 stars, but gets a bonus for concept and community and its potential for classroom use.